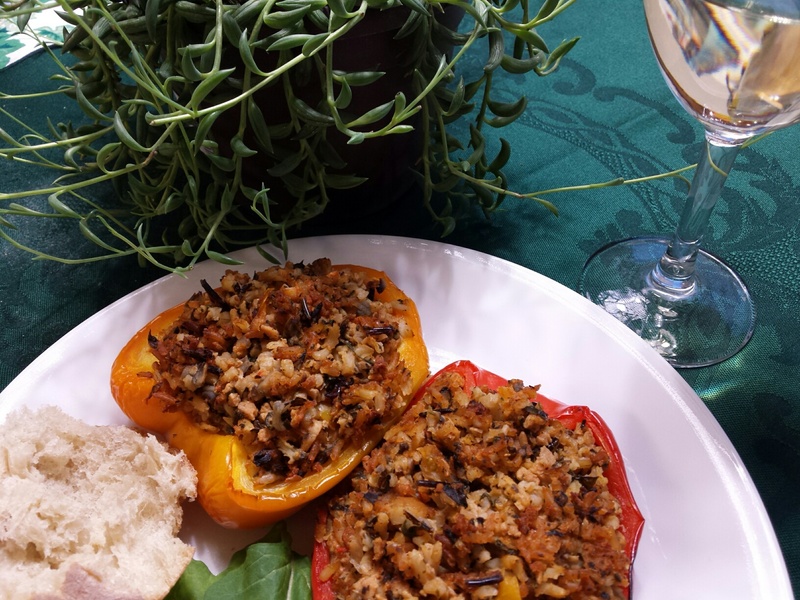 Why have boring green peppers when you can feast your eyes on orange, yellow, and sweet red peppers stuffed with a savory rice-rich mixture? Any leftover rice mix can be baked in a loaf pan. If you use fresh herbs in this recipe, use three times the quantity. Don’t be put off by the long list of ingredients; if you prep before you start, it goes much more quickly! Cut peppers in half crosswise or lengthwise. Remove stem, seeds, and ribs. Blanch for 1 minute: Place into boiling water for 1 minute, then remove and immediately place into ice water bath for 1 minute. Set each pepper on a rack or towel to drain. Preheat oven to 350 degrees. While rice is cooking, prep the vegetables. In a large pan, sauté onion and chopped peppers in oil for 2 minutes. Add spinach, mushrooms, garlic, salt, and black and cayenne pepper. Cook on medium heat until spinach and mushrooms are soft, 3 to 5 minutes. 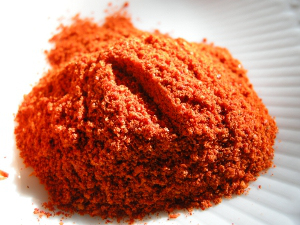 Add cooked rice, tomato juice and ketchup, TVP and spices; blend well. Turn off heat and let stand 5 minutes. Place pepper halves in a 9 x 13 pan sprayed with oil. Stuff gently with rice mixture. Bake, loosely covered with foil, for 1 hour. Delightfully lemony, these vegan donuts are light, not too sweet, and take just a few minutes to throw together! 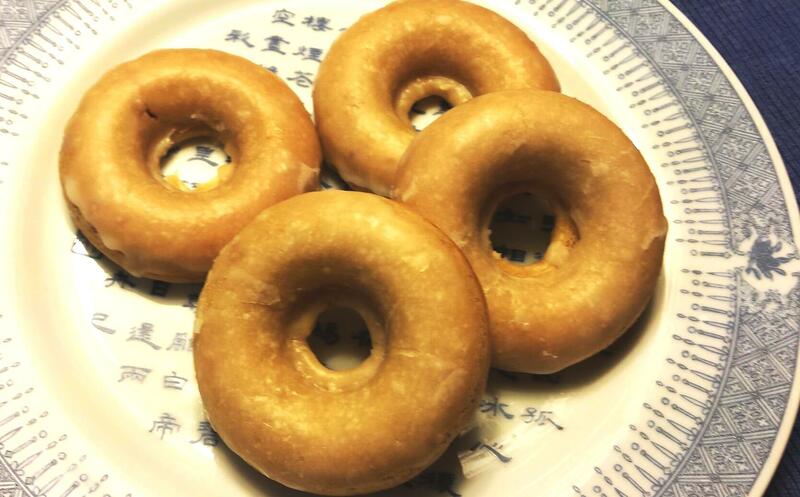 It’s best to bake them in a donut pan – the donut shape looks really cool – but a muffin pan works just as well. These donuts are best eaten fresh, although they will keep for a couple days (if they last that long!). Preheat oven to 350 degrees. Mix dry ingredients in a large bowl. Add wet ingredients, and stir just enough to remove dry spots. You may need to add a bit of water, a teaspoon at a time, so that batter is not too thick to pour into pan. Fill the indentations 2/3 full. Bake for 11-15 minutes. Makes one dozen. Cool donuts on paper towels on a rack, and when cool, dip the top into glaze. Before the glaze dries, you can add toasted almonds, poppy seeds, or whatever you like. 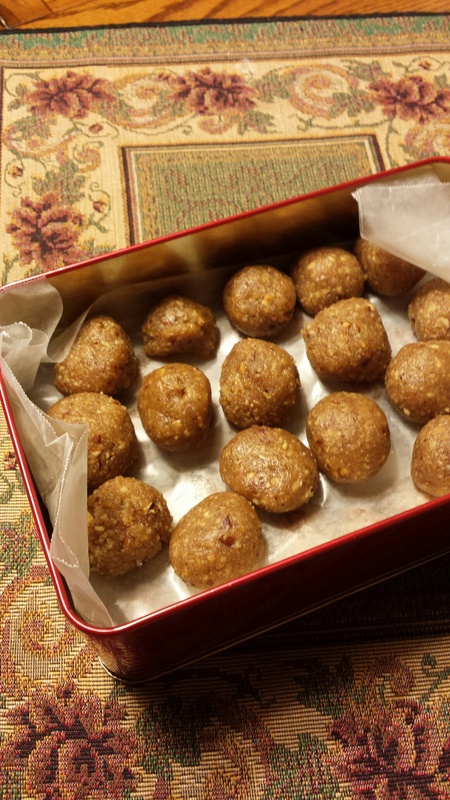 Lauren requested a holiday candy recipe with peanut butter or “something like that.” Sue got busy in the kitchen and concocted these festive rum balls. A natural-foods store visit may be necessary to get high-quality vegan and organic ingredients, but the resulting great flavor is worth it! These rum balls are very rich, so you’ll want to make them small. With only 5 ingredients, they’re easy to make, so add some flash to your holiday stash! Mix all ingredients together. Add the remainder of the crumbs if the mixture is not stiff enough. Chill for 10 minutes. Roll a small clump of dough between your palms briefly. Balls should be about 3/4 inch or 2 cm in diameter. Place on cookie sheet and refrigerate. When chilled thoroughly, you can place them in a sealed storage container in the fridge. Optional: Drizzle with melted vegan chocolate or carob chips. 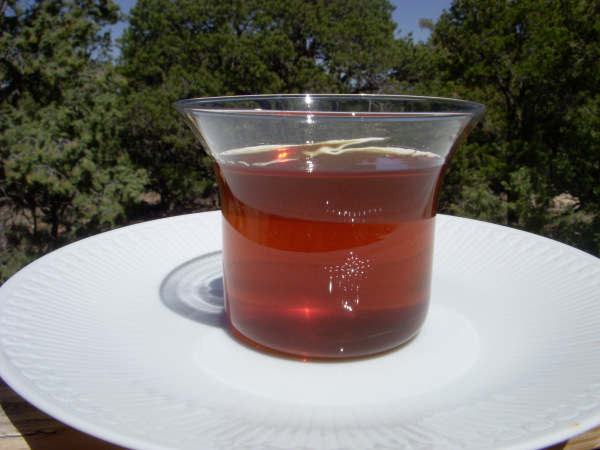 This is a delicious two-part liquid libation in which you can control the flavor and the potency. So it could be a potent drink that may result in a face plant, or it might just be a delightful diversion – you choose. 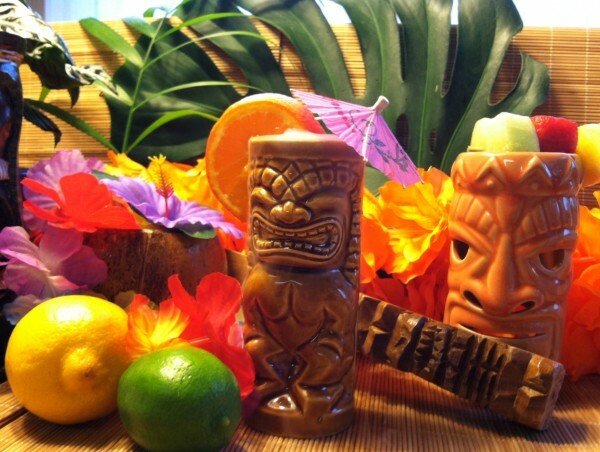 You can use an insulated mug; a short, wide glass; or a fancy Tiki mug. (You may need to taste and add more ginger ale.) This recipe will quench the thirst of two or three people. Pour over ice in two or three Tiki mugs. Add half an orange slice to each glass. Pour ginger ale over all until desired strength is reached. Stir and add a colorful umbrella! Sue decided to call this drink a Mint Fuzzy Slipper because if you drink too much of it, your brain will feel like fuzzy slippers (as will your mouth the next morning). Vegan versions of Crème de Menthe and Crème de Cacao are readily available, but check labels to be sure. Place 3 candy canes on a ceramic plate. Cover with a paper towel and use the bottom of a sturdy glass to carefully crush them. Moisten the rim of a 3 oz. glass and dip into crushed candy. Place the first three ingredients into a cocktail shaker with a few ice cubes. Shake vigorously, then strain into glass. 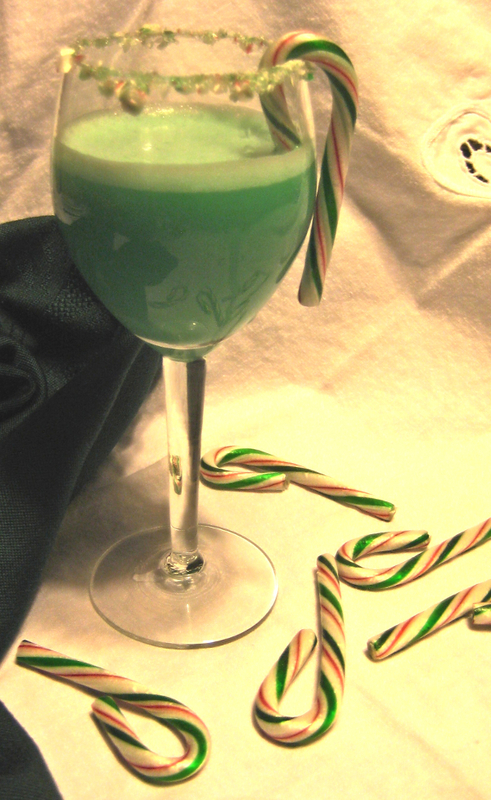 Add a candy cane as garnish. Sip in front of a fireplace if possible. 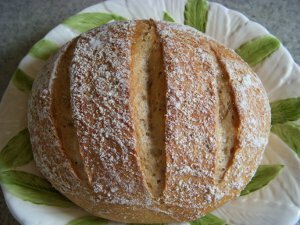 What is it about fresh, warm, home-baked bread that is so comforting? This Italian flatbread recipe is surprisingly easy to make, and its delicate flavor goes with almost everything. It cooks up so fast; you’ll want to make this for dinner a couple times a week. Place all dry ingredients in a mixing bowl, and use a fork to gently blend them. Make a well in the center, and pour the oil and water into it. Mix gently until completely blended. If necessary, add a teaspoon or two of cold water; then knead with your hands until dough is smooth. Pull out a wad of dough about 2 1/2 inches across – slightly larger than an egg or a ping-pong ball. Place onto a lightly floured surface and spread with your fingers into a flat disk about 8 inches across. The top will be uneven. Heat a large nonstick frypan over medium-high heat. 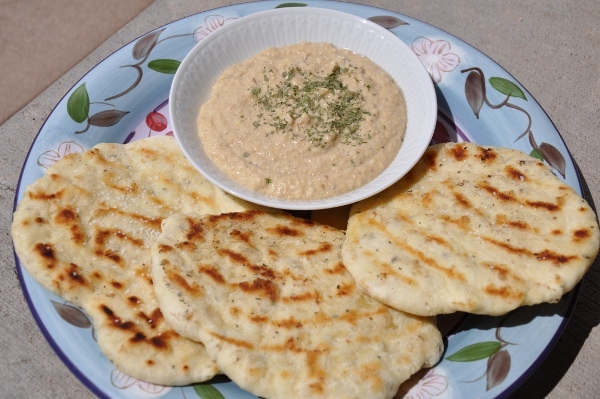 (We used one of those grill pans with the ridges in the bottom, which gave the bread in our photo the sear marks.) When pan is hot, brush the flat dough disk with olive oil and place oiled side down in the pan. Heat for about 2 minutes until a few brown spots appear on the bottom. Brush top with olive oil, flip bread over, and cook another 2 minutes. Slide out of pan onto a plate with paper towels on it, and sprinkle with a little kosher salt. Repeat with the rest of the dough. Serve while warm. 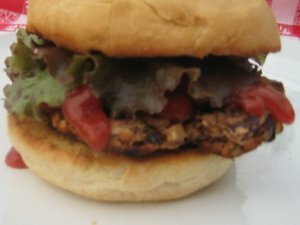 What do you all think about maybe adding some flecks of sun-dried tomatoes to this recipe…or pine nuts? I also think this bread might be delicious with a homemade veggie burger. This recipe is easy, although it may take 10 to 15 minutes to boil the ingredients. You can also use chopped almonds, pecans, or pistachios instead of peanuts. 2. In a heavy 2-quart saucepan, bring sugar, corn syrup, salt, and water to a boil over medium heat, stirring frequently, until sugar is dissolved. Stir in the peanuts. Clip a candy thermometer to the inside of the pan, but don’t let it touch the bottom. Continue boiling the mixture on medium-high heat, stirring constantly, until temperature reaches 300 degrees. 3. 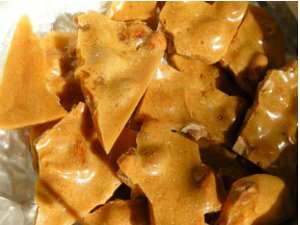 Remove candy thermometer, add baking soda, stir, and quickly pour mixture onto the baking sheet. Spread it out with a fork. Allow the pan to cool on a rack, and then break candy into pieces. While on vacation in September, I broke my foot in three places. I spent two days in Lisbon before flying back to the States, and it was a sad affair. Instead of the planned sightseeing and city tours, I was laid up in the hotel for most of that time. Learning to use crutches is difficult, but using crutches on sidewalks with centuries-old cobblestones is even more of a challenge. I stayed in our hotel’s lounge while my cousin went out to see the city sights. On the first day she came back and reported that there was one restaurant close to the hotel, and she thought it was near enough that I could make it on crutches. “I don’t know what kind of restaurant it is and whether they have anything for you though,” she said. I was so excited to leave the hotel and experience something (anything!) of Lisbon, I was willing to try. Even in non-veg-friendly restaurants, you can usually at least order a salad, right? We decided to try it. After a herculean effort on my part maneuvering over the uneven sidewalk stones, we made it to the restaurant door. What kind of restaurant was it? 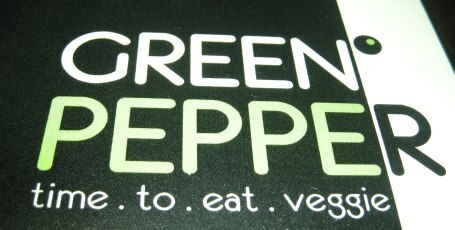 When in Lisbon, check out Green Pepper at 14 Avenida José Malhoa. The food is fresh and inventive, and they also have a wide selection of yummy drinks. The servers are friendly and attentive. They made my day. Raw foods are even more delicious in the summertime, when the hot temperatures deter even us diehard cooks from venturing near a stove. 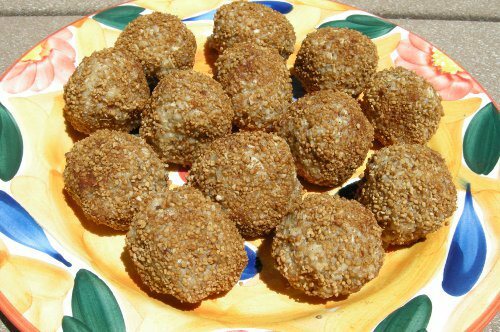 I came across this recipe for raw doughnut holes on the Rawmazing site. I happened to have a bag of Brazil nuts on hand, so I tried it right away. Yum. Let the doughnut holes sit in the refrigerator for a bit before you eat them or else the texture won’t be quite right (but they’ll still be delicious). Spinach is an amazing powerhouse of vitamins and minerals: Vitamins B1, B2, B3, B5, B6, C, E, and K, plus folic acid, calcium, potassium, and zinc. Mandarin oranges contain vitamin C. Both mandarin oranges and spinach are fat-free, and pecans are high in fiber and protein. This colorful salad is not only nutritious, it’s also beautiful, and the complex dressing provides a wonderful burst of flavor! 1. Toast pecans in a pan over medium heat for a few minutes, watching them carefully. When they start to brown and release their oils (about 2 to 3 minutes), remove from pan and place on paper towels to cool. 2. 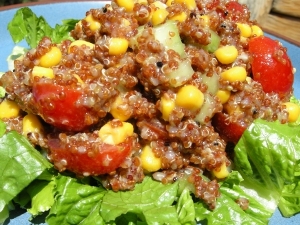 In a large bowl, combine next 7 ingredients with a wire whisk to make the dressing. 3. 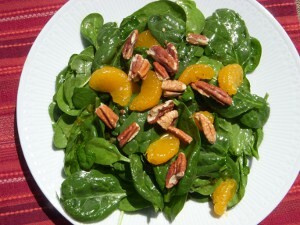 Add spinach leaves and orange slices; combine with dressing. Arrange salad on serving plates. Top with toasted pecans. 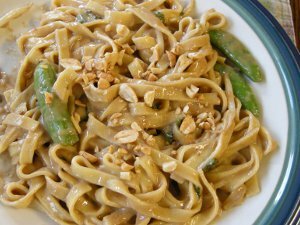 Variations: You can add sliced green onions if you like them, or substitute toasted sliced almonds or pine nuts for the pecans. Back in January, we showed you how to make homemade vanilla extract. Here’s the finished product. Wish we could share the amazing aroma with you. 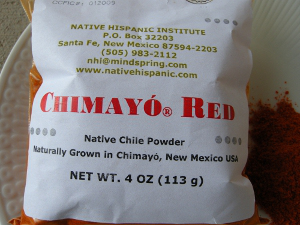 Besides chip dipping, this salsa also works great as a taco or burrito topper. 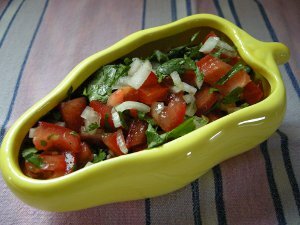 If you prefer chunkier salsas, substitute 4 chopped tomatoes for the tomato juice (for a total of 6). Combine all ingredients. Dip your chips. Food labeling in India: The green image denotes a product without animal ingredients, while the image on the right labels products containing animal ingredients. Image courtesy of Kotra and the Wikimedia Commons. A reader named Pradeep wrote to tell us about India’s veg-friendly food-labeling system, in which a green dot on a product means it does not contain any animal ingredients. Pradeep is now in the United States and has difficulty identifying veg products. 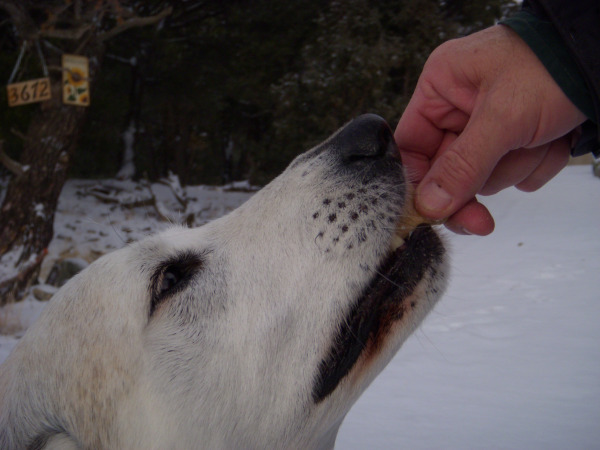 He has to examine food labels and determine whether unfamiliar ingredients might be derived from animals. And it’s no wonder. Here’s a little background for those who may not be aware of how veg food labeling works in the United States (hint: it’s much different from India’s system). The U.S. Food and Drug Administration’s (FDA’s) Food Labeling Guide only addresses animal products in the food allergen section, and the FDA passes the buck by saying: “We recommend that producers of meat products, poultry products, and egg products, which are regulated by the U.S. Department of Agriculture (USDA), contact appropriate USDA agency staff regarding the labeling of such products.” A search through the bewildering maze of the USDA’s Web site doesn’t shed much light on that agency’s stance on labeling. Enter the Vegetarian Resource Group (VRG), which provided a thoroughly researched overview of the labeling situation in 2006, concluding, “There is no federal regulation of the word ‘vegetarian’ or ‘vegan’ in the United States.” So although food products in the United States lack a federal label that would indicate products containing animal ingredients, individual organizations are stepping up to the plate to address the issue. The Vegetarian Label Fact Table in the VRG’s article compares these labels and what each might indicate. If anyone is interested in working with Pradeep on a labeling campaign in the United States, contact us and we’ll forward your info to him. In the meantime, keep reading those labels, and share your shopping strategies with us. Dairy-free milks have come a long way in recent years. Many restaurants and coffee shops offer soymilk or rice milk (and unlike years past, the servers usually know what you’re referring to if you ask for it). And I think that every major grocery chain now offers soymilk and almond milk in the dairy cases. But even more options are available. Although I was accustomed to the “beany” taste of soymilk, I can’t say I ever really got off on it. 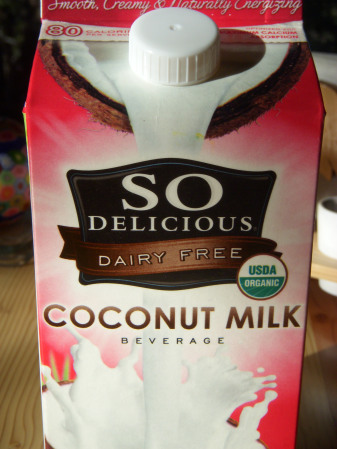 About a year ago, my friend Jill recommended coconut milk, and I haven’t gone back to soy since. I love the creamy texture of the coconut milk in my coffee, soups, and baked treats. I buy the organic So Delicious brand, which can be found in the refrigerated section. Aseptic packaging on the shelf is also available, so I keep a few extras in the pantry. 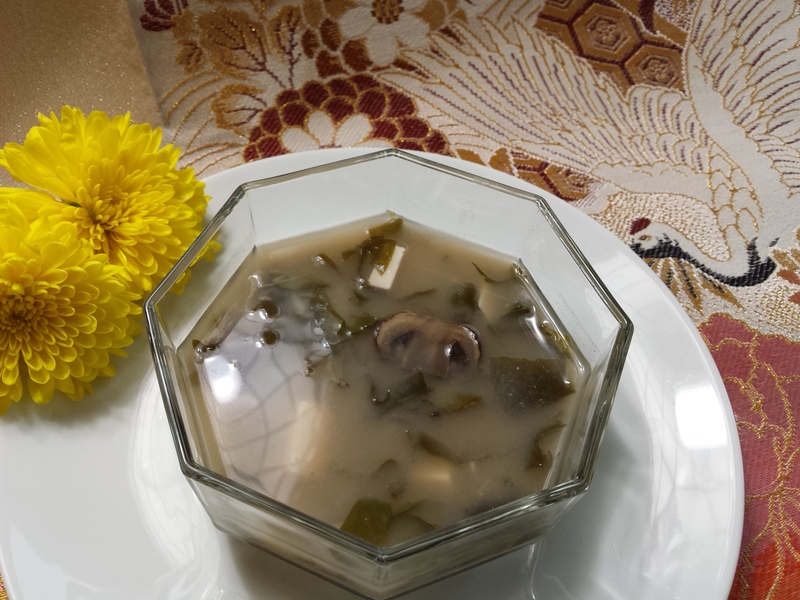 Try it in broccoli rice soup. I love the taste of almond milk. Although some brands lack the thick, creamy texture that I prefer for coffee, it’s a great choice for cereal and also in baked cranberry walnut oatmeal. It also adds a terrific nutty flavor to smoothies. Hazelnut milk is similar to almond milk. Look for it in aseptic packages on the shelf. Like soymilk, rice milk is available in unsweetened versions as well as flavors like vanilla and chocolate. Although I don’t cook or bake with it, I do use it in smoothies. And the mini packages are nice to take along on trips and camping excursions – no refrigeration required. One dairy-free milk that I haven’t tried yet is hemp milk. It’s on my next shopping list. Let us know if you’ve tried it. This soup tastes creamy (without the cream). 1. Heat oil over medium heat in a large stewpot. Sauté onion for 2-3 minutes. Add the vegetable broth and rice. 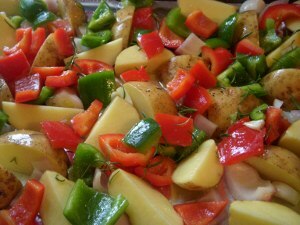 Reduce heat to low; cover and cook until rice is tender (about 20 minutes). 2. While the rice cooks, steam the broccoli florets until they’re tender (but not mushy). 3. Allow the rice mixture to cool a bit, and then ladle into a blender or the bowl of a food processor. Process the rice mixture with the broccoli florets. 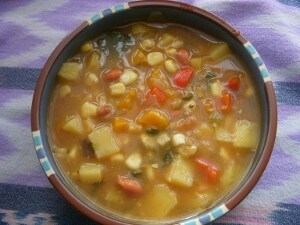 Return the soup to the stewpot and stir in milk and spices. Heat through and serve. Serves 4. There’s no need to serve an uninspired meal after a long day at work. This dish is super fast, and the tasty sauce easily rivals one from your local ethnic family restaurant. The bonus of eating at home: You get to personalize it with your favorite veggies. We included more ingredient ideas below the recipe. 1. Start preparing rice or udon noodles according to package directions. While the water boils or the rice cooker heats up, prepare the veggies. 2. 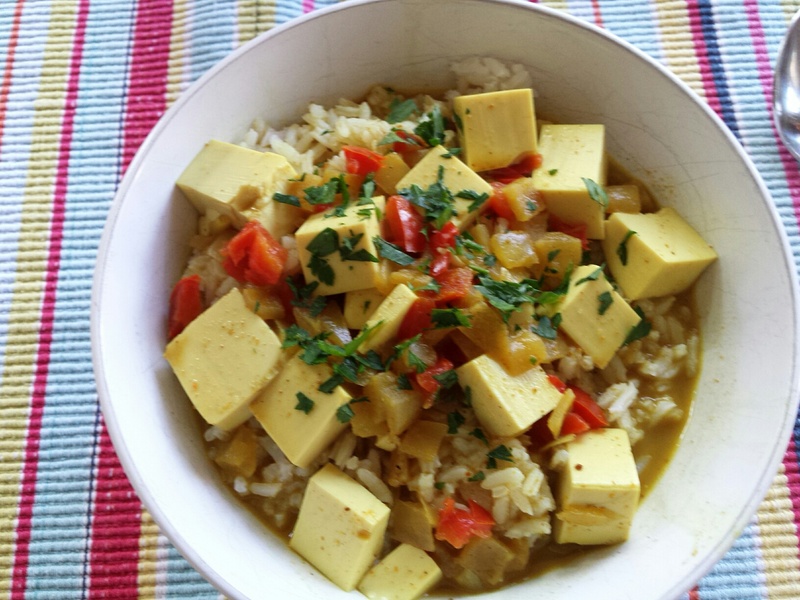 In a small pot, combine coconut milk and salt, turmeric, garam masala, cumin, and paprika. Heat on low while veggies cook, stirring occasionally. 3. Heat the canola oil in a large pan or wok. Sauté onion and garlic until translucent. Add mushrooms and zucchini; cook for 3 minutes or so. 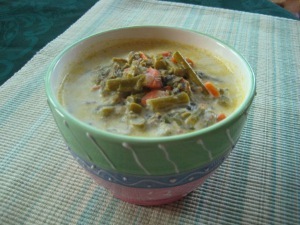 Add thawed frozen vegetables and canned vegetables at the end; cook until heated through. 4. 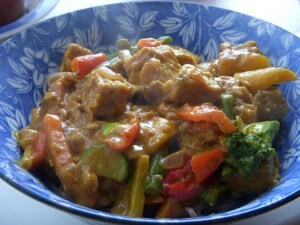 Serve veggies over cooked rice or noodles, and spoon curry sauce over the top. 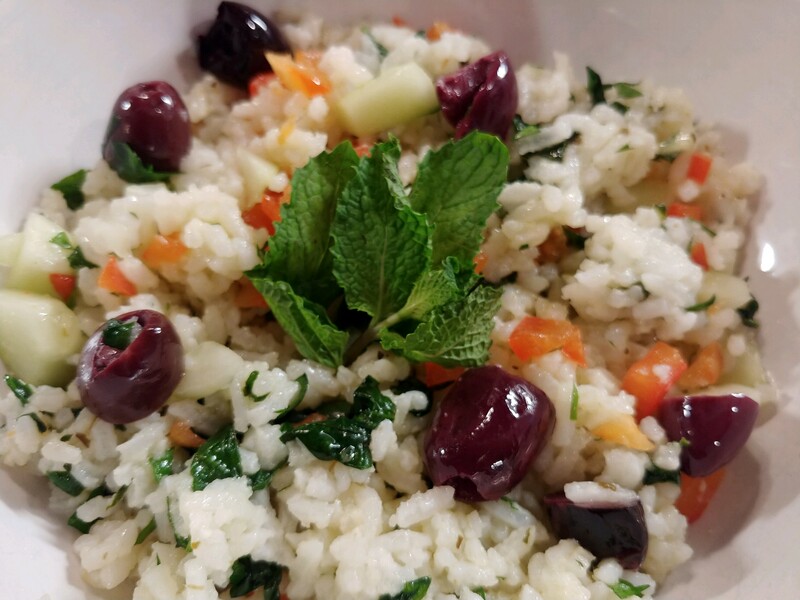 Garnish with a sprinkling of chopped fresh cilantro leaves. 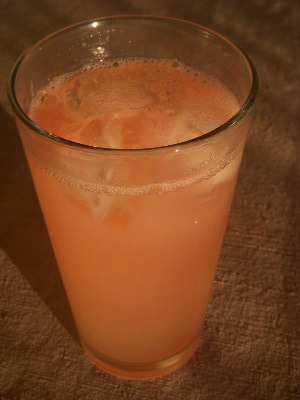 We’re extremely fond of a certain imported Italian grapefruit soda from a well-known natural foods chain. Inspired by the abundance of excellent citrus in stores right now, we wondered if we could make our own homemade grapefruit soda and duplicate the flavor of the imported soda. Well, the results were REALLY GOOD. First, halve a grapefruit and squeeze the juice from the fruit. (We averaged about 3/4 cup of juice from each grapefruit, but these seemed to be very juicy, and I suspect that most grapefruits may yield a bit less.) Pour 3/4 cup to 1 cup juice per glass. Add sparkling mineral water and a squirt of agave nectar if you like a bit of sweetness. Stir and add ice. Sip and enjoy. 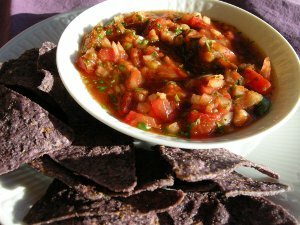 This delightful, fresh Mexican condiment, also called salsa fresca, is simple and delicious. 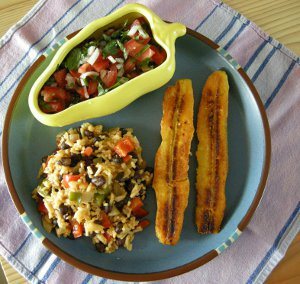 Use it as a taco or burrito topping, or pair it with plantains and black beans and rice for a Latin-inspired dinner. Or just dip your chips in it. Mix all ingredients together in a large bowl. Serve at room temperature, or refrigerate briefly before serving. Pico de gallo is best served shortly after preparing it. I recently experienced sticker shock at the grocery store while shopping for vanilla extract, which prompted me to instead purchase vanilla beans and vodka. Time to make homemade vanilla extract! First, I checked Barnivore to find a vegan-friendly vodka and settled on a pint of Skyy. Then I found two empty jars with lids. You can use one large jar, but I’m going to divide my batch and give my kitchen cohort Sue a jar of homemade vanilla extract so that she can bake something yummy for me. 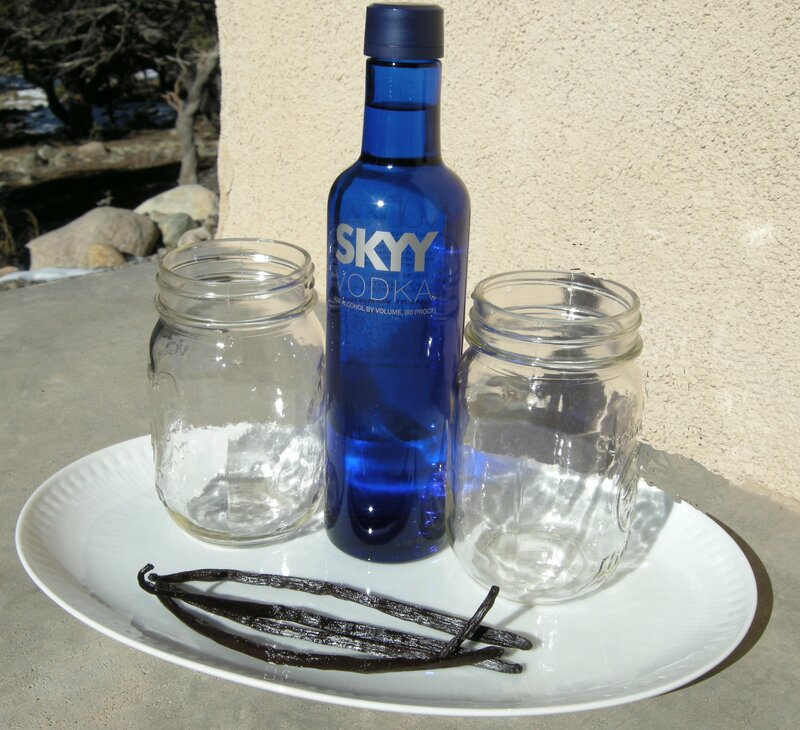 Slice four or five vanilla beans down the middle and split each one, place them in the jar(s), and cover with vodka. Seal tightly and let sit for at least 5 weeks. The longer they stew, the stronger your extract will be. 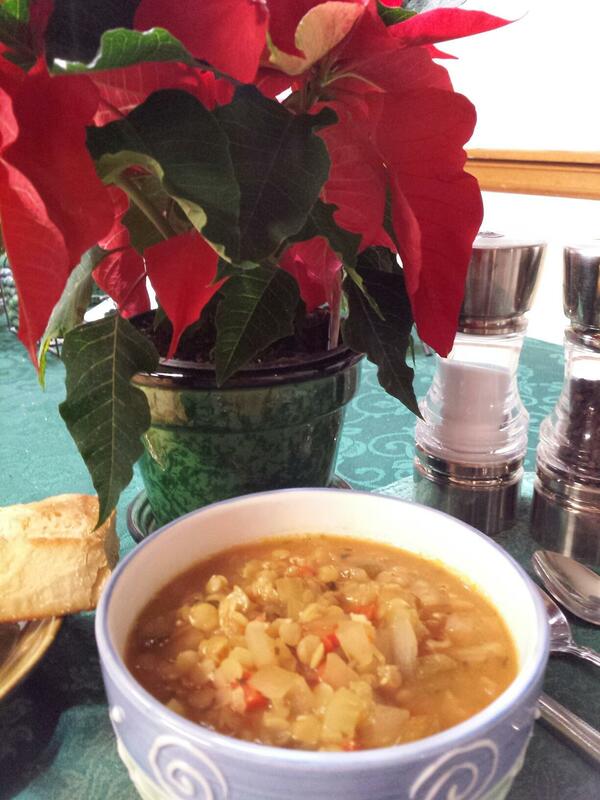 If you’re experiencing post-holiday blues and you’re still facing weeks of winter weather, try focusing on one really good thing about winter: big pots of hot soup. This one incorporates the best of winter’s produce offerings. 1. Heat olive oil in a stewpot over medium heat. Sautè the onion 5 minutes or until transparent. Add celery and garlic; stir to combine. Stir in the carrots, turnip, and potatoes. Cover and cook for 5 minutes. 2. Add spices, vegetable broth, and barley. Bring to a boil. Reduce heat, cover, and simmer for 25 minutes. 3. Add beans, pasta, and tomato paste. Return to a boil. Reduce heat, cover, and cook over medium heat until the pasta is tender. 4. Stir in the chopped kale and cook for about 5 more minutes. Season to taste with salt and pepper. Use fresh herbs for best results. Combine all ingredients in a large container; combine with a whisk. Keep refrigerated. Love the flavor and texture of artisan loaves from the bakery but tired of paying sky-high prices? Make your own for a fraction of the cost! Yes, baking your own bread can be time-consuming, but it’s also very satisfying. And once you taste that warm, crunchy crust fresh from your oven, you may never go back to store-bought breads. Here’s a basic recipe to get you started. No kneading is required. Feel free to experiment with some variations: Try topping with coarse salt, sprinkling some dried herbs into the dough, or adding some special ingredients like sun-dried tomatoes, finely chopped olives, or sprigs of fresh rosemary. 1. Mix 1/4 cup of the warm water with the yeast and sugar. Let stand for about 8 minutes until yeast is foamy. 2. Add remaining warm water. Mix flour and salt in until well incorporated (try adding the flour 1 cup at a time). Dough will be “wet” or rather sticky. Place dough in lightly oiled bowl, cover with a damp dish towel, and let rise for 2 hours in a warm, draft-free area. (If our house is cool and drafty on baking day, we place the bowl inside the oven on its lowest setting with the door propped open a bit.) Note that the dough may be hard to work at this stage. 3. After the dough rises, place it on a tabletop lightly dusted with flour. 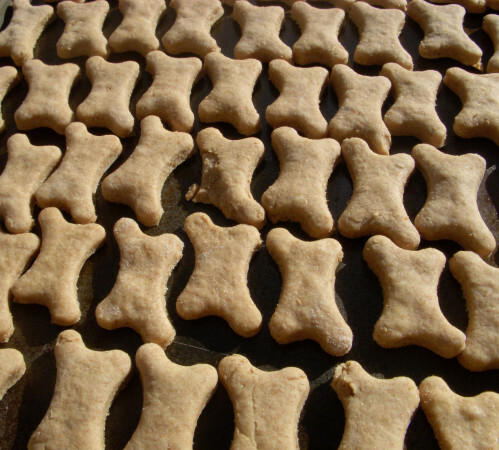 Divide dough into two small rounds* if desired, or just make one loaf. Add a little more flour if the dough is sticky and hard to work. Sprinkle flour on top of dough, and tuck sides under to create desired loaf shape(s). Place dough on a lightly oiled cookie sheet. Allow it to rest for approximately 40 minutes. 5. Bake for approximately 40 minutes or until golden brown. Oven times and temperatures vary, but with practice, you’ll be able to produce a picture-perfect loaf every time. *A small round loaf of artisan bread is sometimes called a “boule” (from the French word for ball). Asparagus is full of vitamins, minerals, and fiber. It has been cultivated around the world for centuries, dating as far back as ancient Egypt. What’s the secret to tender asparagus? Using a paring knife, cut a half-inch off the bottom of the stalk. If it cuts easily, it will be tender. If it resists cutting, try again a half-inch higher until you find the place where it can be sliced easily. 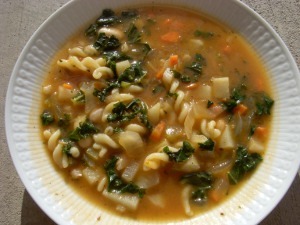 This soup is light, healthy and tasty. It’s great for a spring lunch or light supper. Try topping it with spicy croutons, and maybe a dollop of soy sour cream. 1. Sauté onion and garlic in olive oil over medium heat, stirring occasionally, until onion is transparent (about 5 minutes). Add broth, carrots, celery, and asparagus. Reduce heat. Simmer on medium-low for 30 minutes. 2. Add spinach, mushrooms, parsley, and salt. Simmer another 30 minutes. 3. Turn off heat and add soy milk; stir. Cover and let stand for 5 minutes. Serve with croutons and a dollop of soy sour cream (if desired). 1. In a food processor, purée all the ingredients until smooth. Pour into a shallow, wide pan and freeze for 1 hour. 2. Rake with a fork, and then freeze for an additional hour. Repeat. 3. 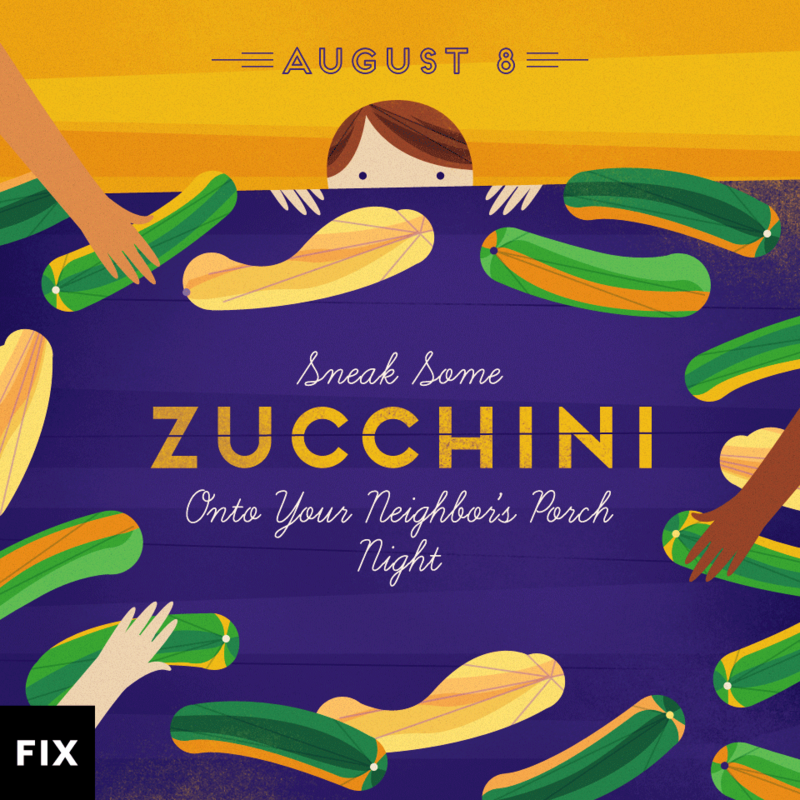 Remove from the freezer, rake, and serve in cups. Makes 2 cups. 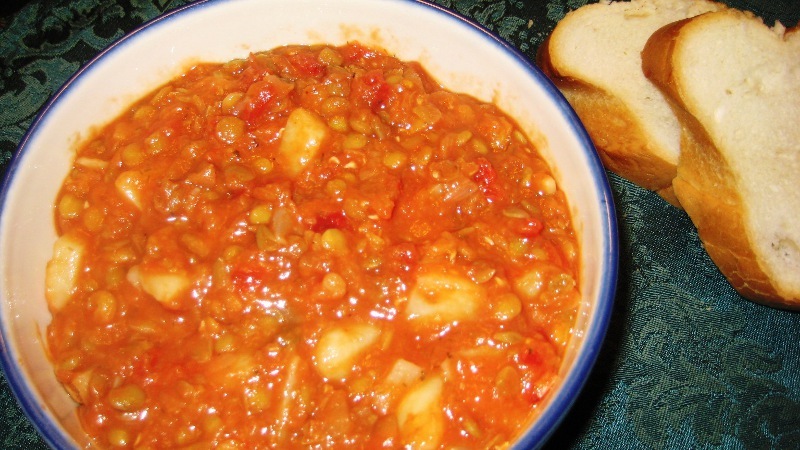 Ratatouille is a wonderfully flavorful French vegetable stew; it can be eaten hot or cold, and it’s very filling! Try adding a thick-sliced fresh baguette to complement this tasty vegetable stew. 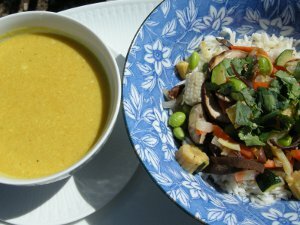 This recipe takes advantage of your summer garden vegetables. Allow some prep time – you’ll be slicing and dicing. We added a teaspoon of Herbs de Provence for an intense country French flavor. 1. Heat olive oil in a large pot over medium heat. Add the garlic and onion and continue to sauté until onion turns translucent, about 5 minutes. Add tomato sauce and stir. Pour in vegetable broth and stir until the liquid begins to bubble. 2. Add the diced eggplant, zucchini, bell peppers, mushrooms, and dried Herbs de Provence. 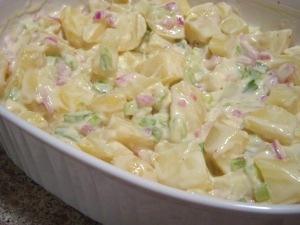 Stir gently to combine, reduce heat to medium-low, and cook for 15 to 20 minutes, stirring every couple of minutes. 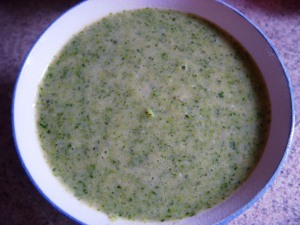 It may look like there is not enough liquid, but do not add liquid – the vegetables will release a lot juice as they cook. Just keep stirring every couple of minutes. The vegetables should be tender but not mushy. 3. Stir in the diced tomatoes. After a minute or two, the tomatoes will be heated through. Turn the heat down to the lowest setting. Stir in the chopped parsley and basil. Add salt and pepper to taste – Sue adds about 1/2 to 1 teaspoon of salt and 1/4 teaspoon black pepper. 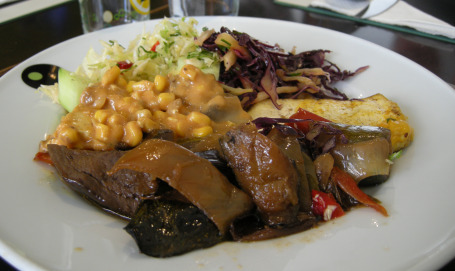 Although ratatouille is usually served hot, it is also delicious served at room temperature the next day, which allows the vegetables a chance to reach their optimum flavor.